Investing online with Casera Financial is easy and flexible. You can check your accounts anytime, anywhere via our 24/7 online and mobile services. 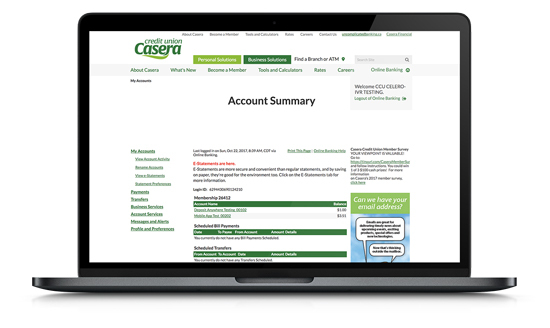 You can view your accounts all in one place, thanks to Casera Financial’s secure online portal. You’ll also have access to e-statements and other services — anytime, anywhere. All that’s required is a computer with Internet access and your personal Casera login information. 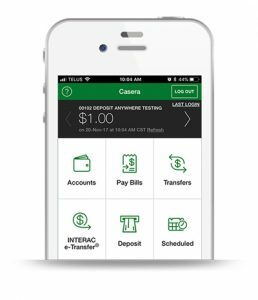 Manage your accounts on the go with our free Casera CU Mobile app for iOS and Android™ devices. The app is easy to navigate, highly secure (you login with the same PIN you use for online services) and lets you access account balances, transfer funds, find rates and obtain assistance. Deposit cheques easily with Deposit Anywhere™. Simply take a photo of a cheque and send it directly to Casera via your Casera CU Mobile app. Casera will finalize the deposit in less than a minute. Please note, there is a five-day hold placed on cheques deposited via Deposit Anywhere™. When you sign up for a Casera Financial account, you will receive an automated email with instructions to finalize your account. When Casera Financial receives your initial cheque, you will receive another automated email with instructions on how to acquire your personal login information and to access our online services.